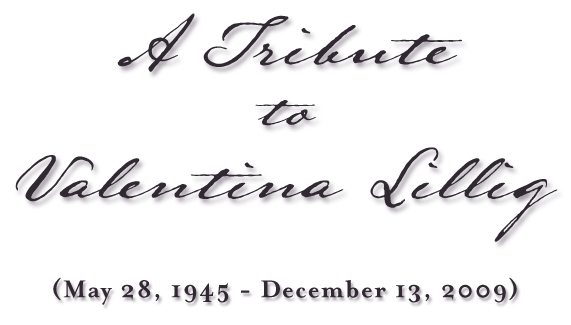 Visionary religious educator, wife, mother and grandmother Valentina Lillig died early Sunday, December 13, 2009, at Loyola University Hospital in Maywood. She was 64. Ms. Lillig, who was known by all as Tina, had been hospitalized since Friday afternoon after suffering a stroke while working in her office at the Catechesis of the Good Shepherd in Oak Park. A longtime resident of Oak Park, Ms. Lillig was born Valentina Varias in Hyde Park and grew up in the Galewood neighborhood on Chicago’s northwest side. She attended St. William grammar school, where she was class president, and Trinity High School in River Forest, where she was Prefect of the Sodality and Vice President of her class. Ms. Lillig, who was of Italian and Filipino heritage, was fond of telling her sons that she was the first non-Irish girl to serve as a class officer at Trinity, whose students were overwhelmingly Irish at the time. After graduating from Trinity, Ms. Lillig attended Loyola University, traveling to Rome, Italy to study Loyola’s Rome Center Campus. While in Rome, Ms. Lillig learned to speak Italian, which aided her in her later graduate studies and in her professional and personal correspondence with Italian theologians and religious educators. Ms. Lillig would sometimes resort to Italian expressions to counsel her sons or to explain ideas that she felt English could not adequately express. Ms. Lillig left Loyola in 1965 without finishing her degree to begin teaching in Catholic schools, which was allowed at the time. At the age of nineteen, she taught first grade at Our Lady Help of Christians Grammar School on Chicago’s West Side. Ms. Lillig’s class, which had 52 students, was the start of a lifelong career of teaching and working with children. In 1967, she married John Lillig, a teacher, former seminarian and Help of Christians parishioner whom she had known since she was fifteen. That year, she taught kindergarten at St. Attracta grammar school in Cicero. She later taught at Providence-St. Mel High School and worked as a copy editor for The New World, the newspaper of the Catholic Archdiocese of Chicago. In 1968 the first of Ms. Lillig’s three sons, John, was born. He was followed by Matt (1970) and Thomas (1973). As a young mother Ms. Lillig was active in La Leche League. The family lived in Help of Christians parish until 1972, when they moved to Oak Park. Ms. Lillig raised her three sons at home, and Mr. Lillig worked as a Chicago Public Schools teacher. During this time, Ms. Lillig contemplated returning to finish her college degree and perhaps eventually working as a librarian. In 1976 Ms. Lillig entered her three-year-old son Thomas in a local Montessori-based religious education program called the Catechesis of the Good Shepherd, part of a program founded by an Italian Montessori educator, Gianna Gobbi and an Italian theologian, Sofia Cavalletti. This simple act would change Ms. Lillig’s life. Thomas was enthralled with the rituals and songs presented to him at catechesis, repeating songs and prayers at home in the family dining room. Ms. Lillig was profoundly affected by her young son’s behavior, which validated her longtime belief that even very young children enjoy an active spiritual life, and it inspired her to register for a training course to become a teacher, or catechist, of the Catechesis of the Good Shepherd. She was able to take the course only because it fell within a three-week period during which her husband, a CTA bus driver in the summer, worked an all-night shift and could stay at home with the children during the day. Ms. Lillig devoted the rest of her life to the Catechesis of the Good Shepherd, eventually becoming its national director and teaching courses to train other teachers throughout the country and in Europe. She worked as a catechist at St. Giles Family Mass Community, St. Giles Parish, and Grace Episcopal Church in Oak Park. Under her visionary leadership, the Catechesis grew into an expansive worldwide organization, with a curriculum used in thousands of Catholic and Episcopal parishes worldwide. The catechesis also has a presence in other Christian denominations. In 1998, she published a book, The Catechesis of the Good Shepherd in a Parish Setting, to guide religious educators who wished to implement a Catechesis program in their own parishes. 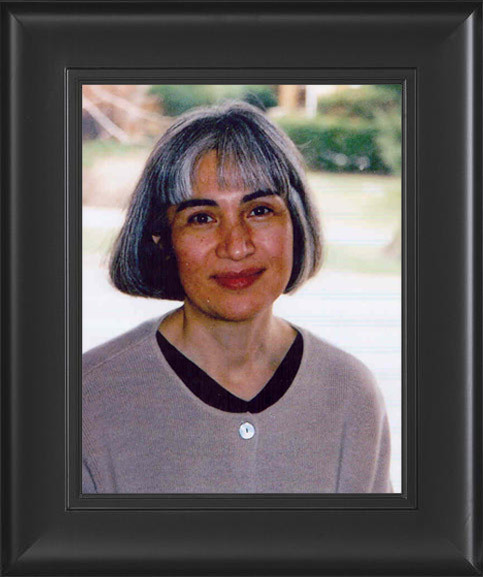 Over the years, she served as an editor and advisor to many other religious educators who sought her editorial guidance in publishing their own work. In 1980, Ms. Lillig returned to Loyola to complete her undergraduate degree in Theology, commuting several nights a week to Loyola’s Lewis Towers campus. She went on to earn a Masters Degree in Pastoral Studies from Catholic Theological Union in Hyde Park. In October, 1999, Ms. Lillig was preparing for a Catechesis meeting in Rome, Italy when she slipped on a marble floor getting out of bed, breaking her hip. Initially taken to an underequipped Italian public hospital that did not even supply her with water, Ms. Lillig declined to undergo an operation there. Friends from the Catechesis were able to arrange for a transfer to a private hospital which served American diplomats, where Ms. Lillig stayed for a few days until her husband came to Italy and flew her home, immobilized, to undergo hip replacement surgery in Chicago. In 2002 Ms. Lillig became a grandmother for the first time. The first grandchild would be followed by five more within a three-year period. Ms. Lillig delighted in her grandchildren, especially enjoying reading to them and taking them to her bedroom to show them the small crucifixes, candles, and religious statues that she kept carefully tucked away in her drawers. Ms. Lillig’s love for her grandchildren allowed her respite from a variety of painful conditions which she began to experience in her last few years. While she was often in significant pain, almost no one around her except her husband realized it because she never complained or expressed any resentment about her pain, and it failed to slow her tireless work in the Catechesis of the Good Shepherd or any other aspect of her active life. While painful, her conditions were unrelated to her fatal stroke, which came suddenly and without warning. When she died, Ms. Lillig was in the midst of an ambitious new project, developing a comprehensive website for the Catechesis of the Good Shepherd that would provide, online, the numerous books and teaching materials that she and other catechists had written or helped publish throughout her career. Ms. Lillig leaves her beloved husband, John Lillig, three sons, John (Anna Lee), Matt (Laura Salvarini) and Tom (Cindy Ivanac-Lillig), her six grandchildren, Eun Hae, Tae Won, Juan, Mariana, Meche, and Coleman, her brother Angelo (Denise Fedewa) Varias, and her mother Frances Fiscella Varias. She was preceded in death by her father, Gonzalo Varias and her sister Graziella Figi.